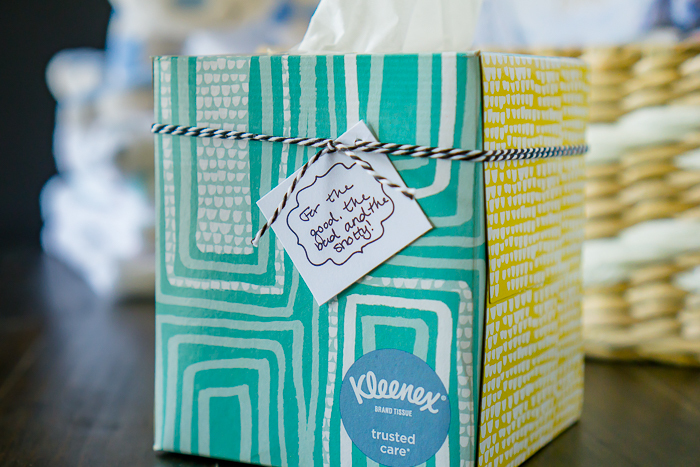 This is a sponsored post written by me on behalf of Kleenex for Acorn. All opinions are 100% mine. 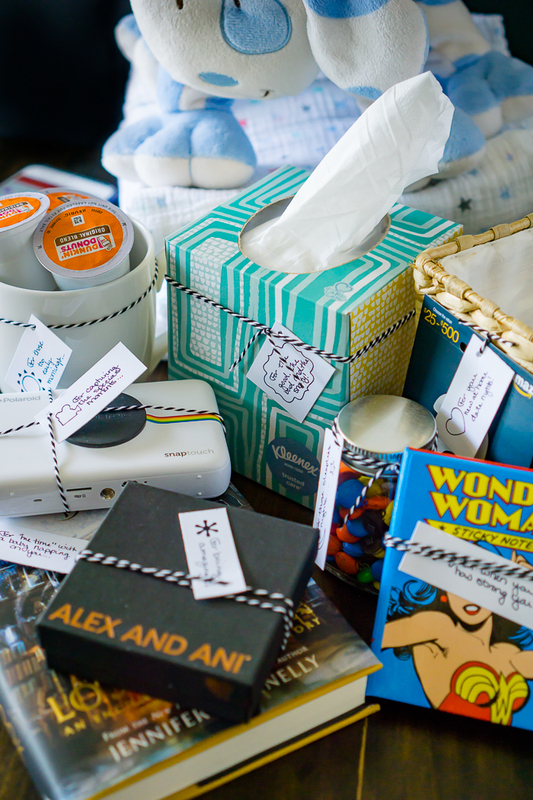 Why All Moms Need Kleenex! 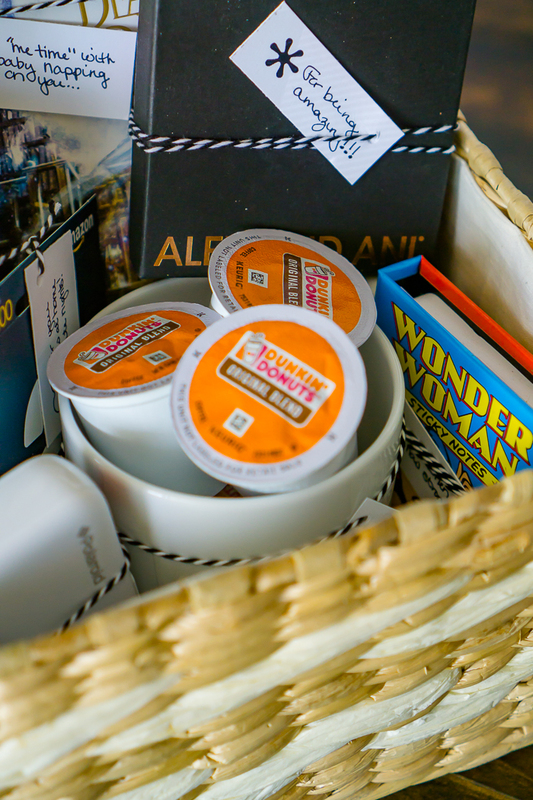 PLUS, New Mom Gift Basket Ideas! I am often asked how things are going as a new mom, especially with finding a balance between raising him and running my businesses. I normally offer a quick, general reply of “it’s good”, “we’re figuring it out” or “it’s definitely been an adjustment”. What I should start saying is that a day at home with Liam requires a lot of Kleenex. No joke. As we slowly approach the year mark of being parents and the due date of our best friends’ first baby, I’ve been thinking a lot about that transition of becoming a mom and how the first 6 months turned me into a bit of a crier. No joke! I cried more in the first 6 months of my son’s life than I have ever cried before – happy tears, sad tears, frustrated tears and even joyful tears. 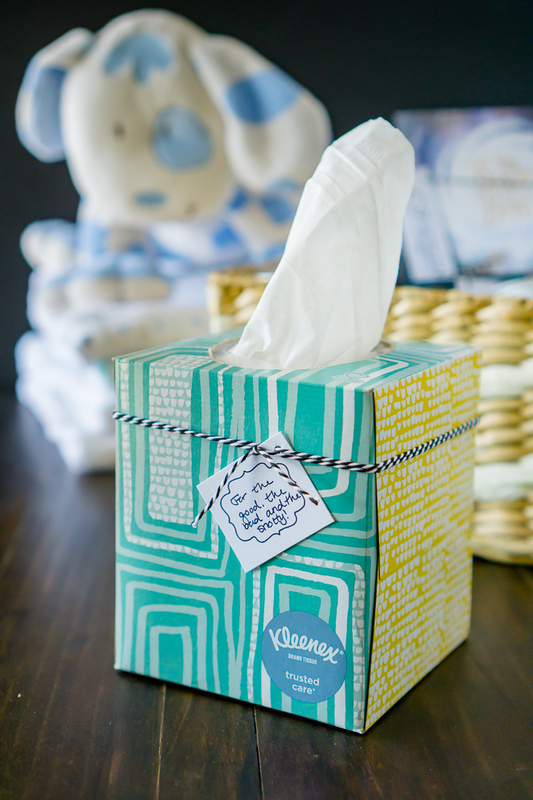 So if I had to give a pearl of wisdom to new moms, it would be to stock up on Kleenex now because you will use it. 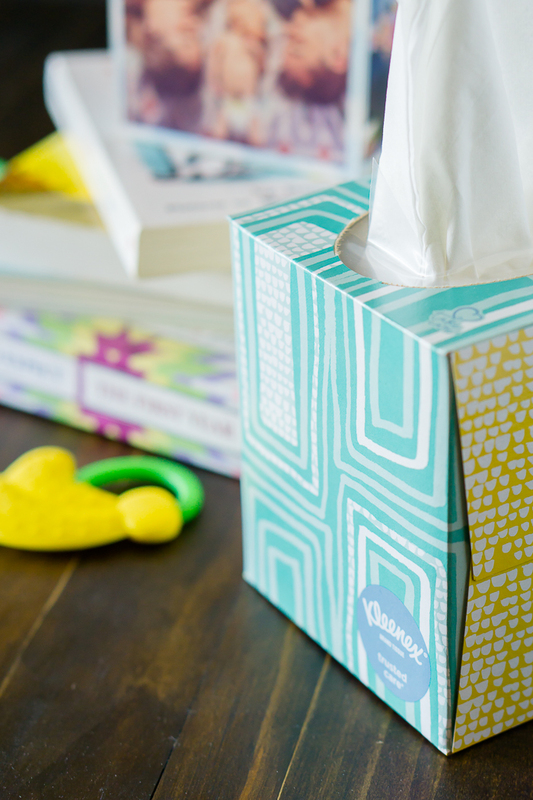 Now is the perfect time to stock up too since Sam’s Club is offering an amazing 16 boxes of Kleenex for $16. 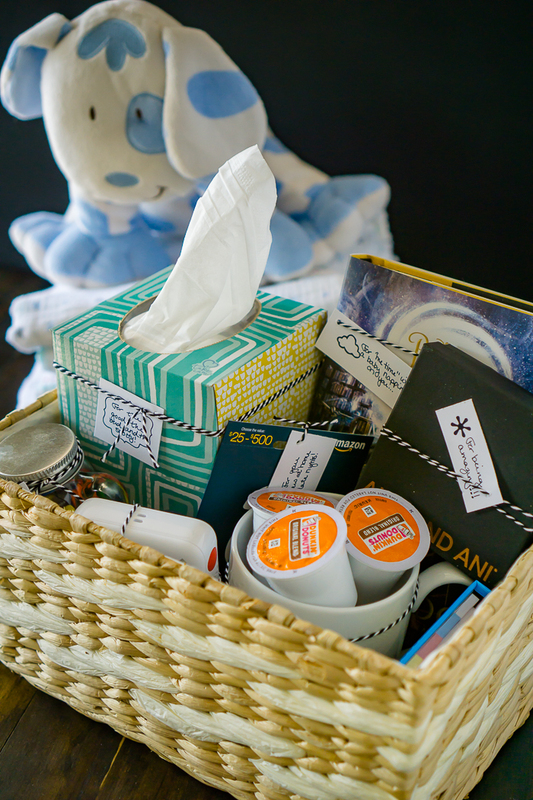 I’m sharing why Kleenex is the essential mom item below in addition to the lessons I learned through it all and sweet gift ideas for a New Mom Gift Basket because new mamas definitely deserve some extra love, too. I Cried Because I Was Tired. Everyone told me when I was pregnant to be prepared to never sleep again. This was not our experience .We were lucky enough to have a baby who was already on a 4 hour sleep and eat cycle when he came home from the hospital, so for me, I was getting more night sleep after Liam was born then when I was pregnant. Yes, more! When pregnant, I was up at least every hour to shift awkwardly or go to the bathroom. Of course there were some rougher nights and there was a 5 week stretch for the 4 month sleep regression where I felt like I was being physically tortured, but other than that I wasn’t up all night every night. I got sleep. I was still exhausted. Your body has just gone through a significant change and now it’s changing again, trying but most likely never really going back to it’s former self. Your hormones are out of wack. You might be adjusting to a new sleep cycle of earlier wake ups and hopefully earlier bed times. You have less time to yourself to just do nothing, a rare commodity even before Liam that I greatly treasured for my mental sanity. Plus, I had a fall baby and found myself hermiting most of the winter with him for ease and health which gets a little boring and also tiring. Now, maybe you are someone who gets tired and becomes the sweetest, most composed human being that ever exists. Not me! I get tired and more sensitive, taking well meaning jokes maybe a tad too personally after having a baby reject his naps that day. I get tired and far more easily annoyed at the fact that my husband couldn’t put a new roll of toilet paper on the holder. I get tired and feel overwhelmingly overwhelmed by my to-do list for work. I get tired, I cry and I reach for the Kleenex Box. I Cried Because I Couldn’t Do It All. Over the years, I tricked myself into believe I could do it ALL with my type-A organization skills, my multitasking prowess, and my ability to stay up late and crank out an A paper in one night. I started my own business, building it up from scratch, and I was going to do it again with a second business all while working from home with Liam…. It’s okay to laugh at me because I certainly do at the naïveté I had. Yes, I am still running my two businesses but I am doing neither with the skill or attention that I would like to. I have had to accept that I cannot do it all ALL THE TIME. I physically cannot photography a family or write a post while also making Liam dinner or playing blocks with him. I cannot be involved in family time outside while Liam explores the grass while also cooking a new blog recipe in the kitchen. At first, this was devastating and led to a lot of meltdowns for the first ten minutes of a nap because I felt like a failure. I felt like I was failing one aspect of my life at all moments. If you are feeling this way, have your cry, take a deep breath, and realize that it’s okay you can’t do it all all the time. If you know someone who can, they are probably just really good at pretending. 😉 Remember that you just made a huge change to your life, your family, your schedule, your body, etc, and that with every change comes adjustment. I Cried Because I Was Lonely. I know this isn’t everyone’s experience, but I also know it’s not just mine. Motherhood can feel incredibly lonely which I think happens for a myriad of reasons. 1, I certainly don’t have the money to be enrolling in a lot of Mommy and Me classes or fitness classes/a gym where it seems a lot of mommy interaction occurs. 2, While home all day, I am also trying to squeeze as much work into the day as possible, so I don’t always have the time to join playdates listed in FB Mommy Groups. I would love to find more work at home moms to connect to because I haven’t met many. 3, I’m in an introvert so stranger anxiety is always a struggle for me. And 4, moms are constantly judged. Mommy judgement is one of the most isolating features of this new parenting gig. You become afraid to say what you are struggling with or the choices you are making for your family and child because you don’t want to invite any negative commentary. Heck, I’ve even been judged because I said parenting is hard with a response of “being a mom is the greatest gift even and you shouldn’t complain.” Really? We shouldn’t share our feelings? We shouldn’t reach out for help? We shouldn’t try to get back to the raising a kid with a village attitude? We should make a new mom feel guilty and go cry in shame because parenting isn’t easy? So here’s my advice: Don’t let the negative noise win. It isn’t easy because they are loud and obnoxious, but stand up for yourself, your family, and the other women standing next to you who want to feel respected as a mom, too. Don’t let them make you feel bad about the choices that are best for your family and don’t make others feel guilty about the choices they make that are different than yours. Be good to one another because parenting can be hard and it’s easier with support. I Cried Because He Was Crying. I was not new to babies when I had Liam. With 4 nieces, a nephew, my best friends’ kids, and many years of babysitting, I am not one to shy away from a baby crying. Heck, my oldest niece was born when I was 16, and she did not like me at first; crying most of the time when I watched her for the first few months. And yet, after Liam was crying for most of the day, miserable about something, I found myself on the couch with a box of Kleenex crying to my husband because I didn’t know what to do. Why didn’t I know? Wasn’t that my job? The only person I wanted to call was my mom, but we had lost her to cancer during my first trimester. There are going to be times where you don’t know what’s wrong. My good friend Amy and I had boys only a few weeks apart and we still often play this Russian Roulette style game of “What’s Wrong Today?” when they have a super cranky day. Teeth? Growth spurt? Bad sleep? Mad they can’t walk yet? Wants to go outside but can’t tell us? Just feels like giving us grey hair? It would be awesome if babies came with translators, but since they don’t, I rely on Kleenex for my tears as well as his snotty, meltdown noses. I Cried Because of Grief. If you are experiencing grief while also becoming a mom, whether from a new or old loss, the waves of grief will most likely come when you don’t expect it. My son is 9 months, and I found myself reaching for Kleenex watching Moana when her grandmother appears near the end. If you want to read more about my journey with grief, read my post about becoming a mom without a mom. I Cried Because I Was So Incredibly Overjoyed. Yes, becoming a mom comes with stress, insecurities exhaustion, and changes to your body, home, and life. Yes, it is hard. But also remember that I started with saying that motherhood really is the greatest source of joy I have ever experienced. You need to stock up on Kleenex at Sam’s Club for just the overwhelming love that you will feel. It is still difficult for me to find the exact words to describe how much richer our lives are with Liam in it. Even now, I sometimes find myself staring at him with tears in my eyes because he is happy and healthy, and I definitely reached for the Kleenex when he said “Mom” for the first time and my heart grew three sizes. Always be kind to yourself through this long road of parenthood and remember to give back to other new moms and help celebrate them, too! 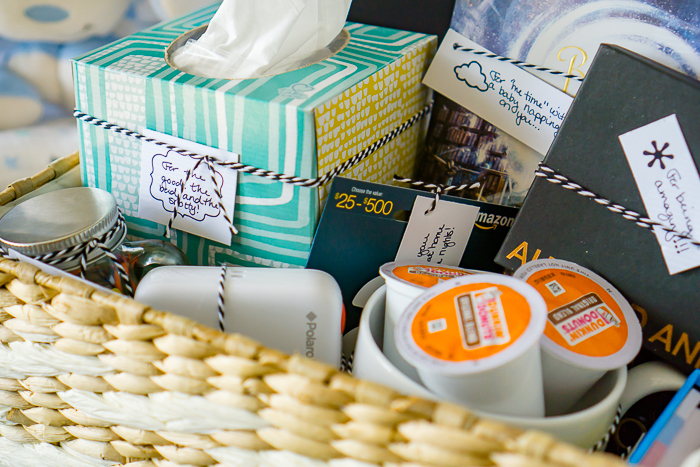 Consider showing up to visit the new baby with a little care package for mom. It’s a great way to make her feel special in this time of transition. We all love the new babes but remember you loved the new mom long before! 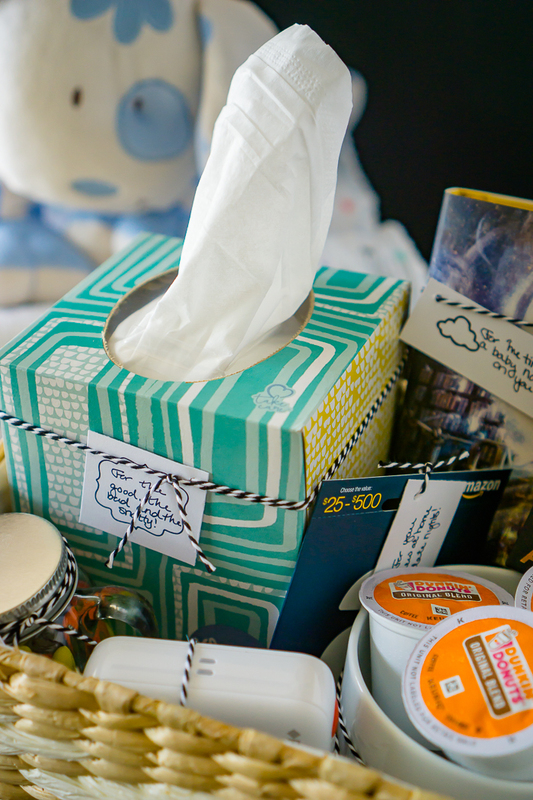 For the good, the bad, and the snotty: Don’t forget to include Kleenex in your gift basket! 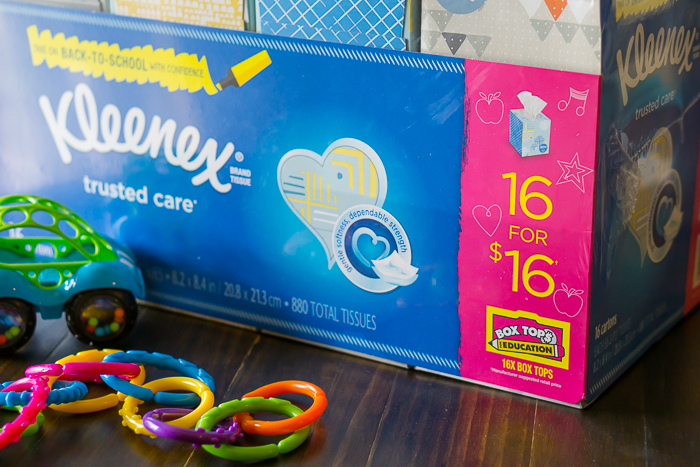 Sam’s Club currently has an amazing deal on Kleenex that you don’t want to miss – 16 boxes for $16. If you follow along on this blog, you know that Sam’s Club is one our must stop shopping locations which has become even more essential since having Liam. We pick up diapers, formula, kleenex, household cleaning items, as well as groceries all at great prices and in one location. My favorite part about shopping at Sam’s Club these days is the app because I can scan all my items as I shop and check out on my phone. It’s super fast and convenient. No lines for this mom which would inevitably lead to Liam tears of frustration over why we are no longer moving.